I'm in the market for a bed. I've been told I should look on Craigslist for a wholesaler instead of going to a store like JCpenney, but I feel a little iffy about spending a lot of money on something in a warehouse I found in the classifieds. 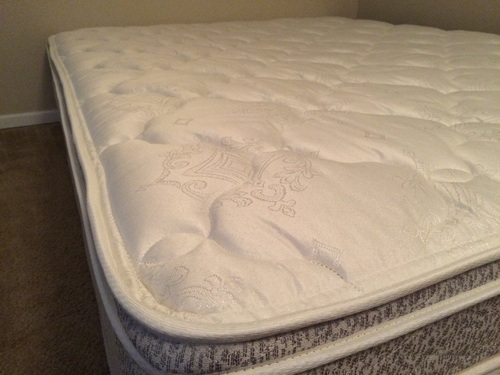 Has anybody else had experience buying mattresses this way? Would you recommend it? If it's the same mattress, I would buy the one that is a better price.I have always looked for weekly sales and then gone into the store to try them out.You might not be able to try it, if you are buying from a wholesaler on line. I highly recommend trying the one you like first ,before buying. Oh and better check out their return policy. If I were in your situtation I would definetly go with the mattress with the better price. And definetly look at the warranty of them. Does anyone know is it safe to buy carpet through a wholesaler online? or will I get ripped off? I love the color pattern of this Daltile. Are they available from any retailers or just through a dealer? Should I buy the wood or metal swingsets from Toys R Us? Any suggestions on a good brand of mattress? This Good Housekeeping microwave cookbook is from 1989! Is it worth buying, or have microwaves changed too much in the last 15 years? How do I know what size throw pillows I should buy for my sofa and should they all be the same size? Should I buy my own carpet and hire an independent carpet installer? Would it be better to go to a full-service carpet store that has carpet installation included in their price? I got these croissants from a local store. I buy them frozen, let them rise, then bake. I want some new ideas on what I can fill them with? We may have to move in a couple of years? Would adding siding increase our houseís retail value? Is it worth it?